A treat never hurt anyone! 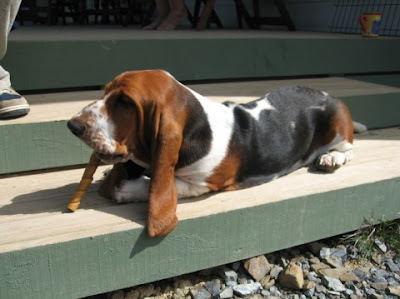 You are here: Home / Bassets / A treat never hurt anyone! 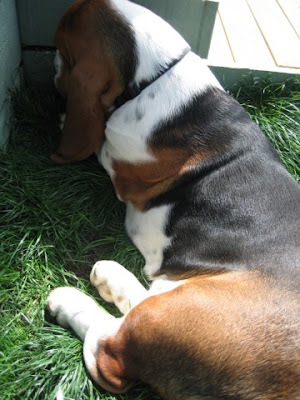 It’s been a tough time for the bassets since their op’s made harder by Fortnum’s longer recovery. However, we try to make it as much fun as possible for them with an occasional treat to cheer them up. Also, Fortnum’s been increasingly allowed to take his hat off and run free and wild. He is much happier when it’s like this but because he needs to be supervised all the time to ensure he doesn’t start licking his wound it can only be a short respite. He looks so depressed when you pick up the buster collar on but despite his hatred of it he placidly accepts that’s the way it’s going to be. Fortnum and Mason are just such different characters. Mason is the bold, clever (sneeky) and athletic of the pair. He is a real attention seeker who loves to make mischief but pretty obedient in training. Mason’s not really food motivated too much and would rather snout around and play in the flower beds given the chance rather than sit with a food toy to distract him. Fortnum is almost the opposite. He’s the follower, more tolerant and loveable in his inability to be agile. He’s a big boy and lumbers around although content to sit or lie on the veranda sniffing into the wind. Most of all he loves food – pretty much any sort. Most of all he loves his bones, pigs ears and treats. In the morning he loves to play picking up his soft toy stingray as he hurries out the door to do his business first thing. He gets very upset when Mason doesn’t want to play and will bark for attention before heading into the corner to sulk or find a way of flopping into your lap for a cuddle. Every day you see them both develop physically and their characters. There is no doubt they create huge amounts of work but they give enormous amounts of pleasure too when you watch them goofy around or simply kicking back basset style and laying in the sun. You can see more of Fortnum and Mason.